RIO DE JANEIRO, BRAZIL – Deep in the Amazon forest in Brazil’s Northern State of Acre, a public initiative that combines the highest technological investments with an eye on a sustainable future has created Natex, the only company in the world that produces eco-condoms entirely with native latex extracted from seringueiras (rubber trees). Natex produces eco-condoms entirely with native latex extracted from local rubber trees, photo by Agência de Notícias do Acre/FLickr Creative Commons License. 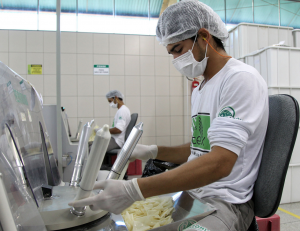 Located in the town of Xapuri, Natex produces millions of eco-condoms, which are distributed entirely for free by the Ministry of Health in Brazil as part of the federal government’s STD/Aids prevention program. Funded by both the federal and state governments, Natex is managed by FUNTAC (State of Acre’s Technology Foundation). Its activities aim at diversifying products derived from the extraction of latex in the Amazon while at the same time stimulating sustainable jobs at a local level by reinforcing the development of products that do not rely on deforestation practices. At the moment, the company employs about 150 workers together with 700 “seringueiro” families living on the Chico Mendes reserve whose livelihood depends primarily on the extraction of latex from the rubber trees. Thanks to subsidies from the state of Acre, Natex is able to pay as much as two times more to its registered seringueiros than other industries that also use native latex as their primary production raw material. The company not only prioritizes the sustainable extraction of native latex, but it also works to provide better living conditions for the seringueiro families of the area, thanks to investments on solar energy panels for homes and the construction of basic sanitation facilities that were previously inexistent. Natex will distribute 100 million eco-condoms throughout most of the Northern and Central regions of Brazil, photo by Agência de Notícias do Acre/Flickr Creative Commons License. The results have been truly impressive, with about “seventy percent of seringueiros” acknowledging that the use of condoms is no longer a taboo in their households. The broader national role of Natex is to distribute about 100 million eco-condoms throughout most of the Northern and Central regions of Brazil, accounting for twenty percent of the domestic demand. According to Bersch, Natex’s objective is to eventually supplement about forty percent of Brazil’s domestic market, helping to partly substitute what the Ministry of Health now needs to import. The advantages of native latex are based on the fact that it is more resistant than cultivated latex since it has fifty percent less minerals plus they are ten percent more cost-effective to produce. As part of one of the world’s largest STD/Aids prevention campaigns, the Brazilian federal government has invested heavily on prevention strategies since 1994, reaching out particularly to schools that participate in the public program Saúde e Prevenção nas Escolas (Health and Prevention in Schools). The Ministry of Health also distributes millions of free condoms through the country’s Sistema Único de Saúde (SUS, Public Healthcare System) facilities.